A home appraisal is an estimate of your home's value. It's simply a professional appraiser's opinion of what he/she thinks your home may be worth. You sign a contract for a $200,000 home with a $10,000 (5%) down payment. Your loan amount in this case would be $190,000 (95% of the purchase price). The mortgage lender is no longer willing to lend you $190,000, because that would represent 100% of the appraised value. The lender reduces the loan amount to $180,500, which represents 95% of the $190,000 appraised value. What if You Don't Agree With the Appraiser's Opinion? Tough luck! No, seriously. Although you and I are entitled to our own opinion on the matter, the mortgage guidelines require the loan amount to be based on the LESSER of the appraised value or the purchase price. 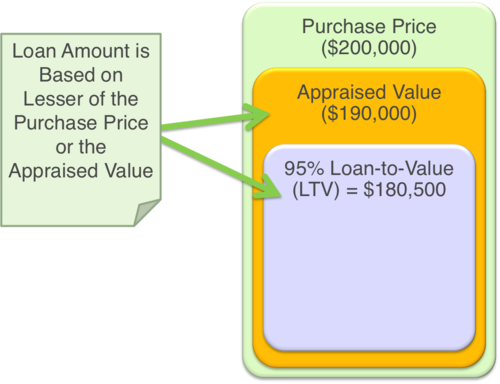 How Does the Appraiser Determine Value? Appraisers are usually required by the lending guidelines to compare your home with similar homes that have sold within the past 6 months. Then, they make adjustments based on the differences in the comparable sales (see illustration below). In this example, Comp 1 sold for $172,000, but it didn't have a finished basement. So the appraiser adjusted the sales price up by $20,000 to $192,000. This means that the appraiser thinks Comp 1 could have sold for $192,000 if it was more like your home. Comp 2 had a basement that was 50% finished, and it only had a 1 car garage. However, it's a little larger than your home. All things considered, the appraiser adjusted the sales price up by $10,000 to $191,500. This means that the appraiser thinks Comp 2 could have sold for $191,500 if it was more like your home. The only major difference between your home and Comp 3, is that Comp 3 is a little bigger than your home. So, the appraiser thinks Comp 3 could have sold for $188,900 if it was more like your home. In this example, the appraiser thinks your home is worth $190,000 based on the comparable sales (and all the adjustments outlined above). Option 1: Renegotiate the sales price. The benefit with this option is that you may save some money on the purchase price of the house. The drawback is that you risk losing the deal because the seller may not agree to renegotiate. Option 2: Increase your down payment. The benefit with this option is that you close the deal without worrying about renegotiating with the seller. The drawback is that you'll need a larger down payment and you may be paying more for the house than it's worth. This is probably one of the most important financial transactions of your life. A CMPS-certified mortgage professional can help you strategize and evaluate your options. Click here to find a CMPS in your area.